President Trump has selected a Washington, D.C., insider as his pick to replace the retiring Justice Anthony Kennedy on the Supreme Court. 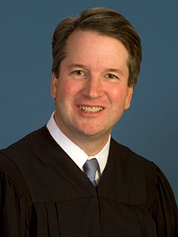 Less than two weeks after Kennedy's announcement, Trump has chosen Judge Brett Kavanaugh from the U.S. Court of Appeals for the District of Columbia Circuit as his nominee for the soon-to-be-open seat on the high court. Experts have described the 53-year-old D.C. native as highly qualified and reliably conservative. "There is no one in America more qualified for this position and no one more deserving," Trump said while announcing the nomination from the East Room of the White House last night. A D.C. Circuit judge since 2006, Kavanaugh has handled more energy and environmental cases than any other short-listers for Kennedy's seat. His skepticism toward a number of EPA programs has won praise from industry and criticism from the environmental community. Green groups are already plotting their opposition to his nomination. Kavanaugh's remarks during last night's announcement centered on his family, legal career and approach to deciding cases. "My judicial philosophy is straightforward: A judge must be independent and must interpret the law, not make the law," he said, flanked by his wife, Ashley, and two daughters. "A judge must interpret statutes as written, and a judge must interpret the Constitution as written, informed by history and tradition and precedent." Kavanaugh has the elite academic background typical of Supreme Court justices, having received both his bachelor's and law degrees from Yale University. He worked as a law clerk for two appellate judges and then clerked for Kennedy on the Supreme Court. He was considered a rising star in D.C. conservative circles in late 1990s and early 2000s, helping to author the "Starr Report" that called for President Clinton's impeachment and later working in the George W. Bush White House. Kavanaugh has the lengthiest record on energy and environmental issues of all Trump's finalists for Kennedy's seat. The D.C. Circuit frequently hears cases dealing with EPA, the Federal Energy Regulatory Commission and other agencies, and the court often has the final say on key environmental law questions. Kavanaugh has weighed in on dozens of high-profile environmental cases, including litigation over the Obama administration's landmark Clean Power Plan. Though the appeals court never issued an opinion in that case, Kavanaugh made his position clear during marathon oral arguments in 2016. He argued that the sweeping climate rule should be subject to a stricter degree of scrutiny because of its "transformative" effect. He also argued that the urgency of climate change does not authorize EPA to exceed its authority (Energywire, Sept. 28, 2016). "War is not a blank check," he said during arguments. "Global warming is not a blank check, either." Kavanaugh has been reluctant to give EPA deference in other Clean Air Act litigation, too. He dissented from his colleagues in 2012 when they upheld earlier greenhouse gas regulations and dissented again when the court approved EPA standards for mercury and other hazardous air pollution from power plants. On oil and gas issues, his experience touches on oil pipelines, natural gas exports and methane regulations. He parted with the court's majority last summer when the D.C. Circuit smacked down the Trump administration for attempting to suspend Obama-era EPA methane standards without going through standard administrative processes. Kavanaugh would have granted a request from oil and gas industry groups to reconsider the decision. He was also involved in important D.C. Circuit case law on how FERC considers the climate impacts of liquefied natural gas terminals. Kavanaugh joined in a unanimous 2016 opinion that found FERC's jurisdiction was limited to the LNG facilities at issue, not the actual LNG exports, which are authorized separately by the Department of Energy. Kavanaugh also played a small role in the Dakota Access oil pipeline saga, joining his colleagues in rejecting a request by the Cheyenne River Sioux Tribe to block the flow of oil through the pipeline last year. Kavanaugh's recent financial disclosures do not show any direct investments in the energy industry. Now a bitter confirmation battle begins. Environmentalists are among an Army of liberal groups already geared up for a fight. "Polluters and corporations will love having Kavanaugh on the Supreme Court," Center for Biological Diversity attorney Bill Snape said in a statement. "The rest of us will suffer the costs for generations to come." Earthjustice President Trip Van Noppen warned that Kavanaugh "has favored unduly limiting federal regulatory powers that are central to keeping Americans safe, and has argued for restricting the rights of people to access our court system." As expected, conservatives quickly offered praise for Kavanaugh's nomination. "When they are faithful to the Constitution's text and original public meaning, judges like Kavanaugh play a vital role in protecting individual rights, including freedom of speech, economic liberty, property rights, and other guarantees of freedom," Todd Gaziano of the Pacific Legal Foundation said in a statement. Case Western Reserve University law professor Jonathan Adler wrote in a blog post last night that Kavanaugh makes federal agencies "do their homework" but is not an "anti-regulatory zealot." 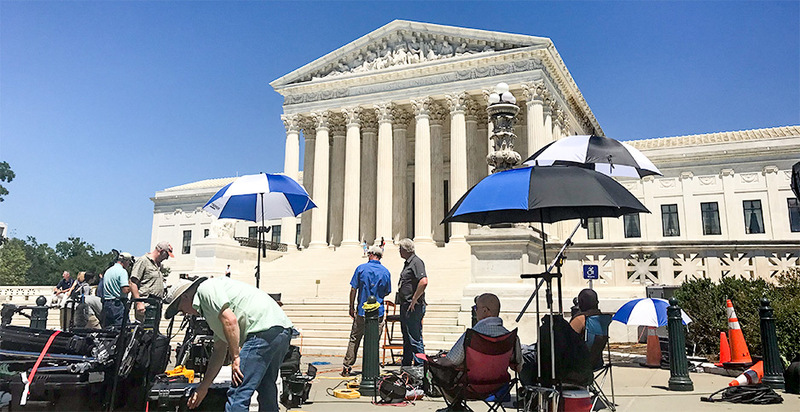 "Where agencies play by the rules, he has upheld their actions against legal challenge, even where the actions in question may seem unreasonable or unfair," he wrote. Supporters and opponents of Trump's pick are now expected to focus their attention on potential swing votes in the Senate: Republicans Lisa Murkowski of Alaska and Susan Collins of Maine and Democrats Heidi Heitkamp of North Dakota, Joe Donnelly of Indiana and Joe Manchin of West Virginia (E&E Daily, July 9).